Point2 Homes gives you far more than a simple list of houses for sale. Get instant access to a lot of relevant information about Leslieville, Toronto, ON real estate, including property descriptions, virtual tours, maps and photos. The search results pages also have a wealth of information on Leslieville, Toronto, ON, if you scroll all the way down. There are 24 houses for sale in Leslieville, Toronto, ON. Searching homes for sale in Leslieville, Toronto, ON has never been more convenient. With Point2 Homes, you can easily browse through Leslieville, Toronto, ON single family homes for sale, townhomes, condos and commercial properties, and quickly get a general perspective of the real estate prices. Also, you’ll never miss a bargain if you filter listings based on house price drops in the past six months. Use the map view to find Leslieville, Toronto, ON homes and apartments for sale, based on amenities or city features that you may want close by. You can close in on a specific neighbourhood or area by simply drawing around them with the polygon or radius tools. Stay informed about the latest entries on the real estate market by saving your searches. This way, you get new listings in your inbox, daily or every week, based on your preferences. If you’d like to get in touch with a professional, agents are displayed next to their listings, and they’re easy to contact through the online forms. If you want more options, you can click the Tools tab and Find an Agent, and you’ll get a list of helpful and knowledgeable real estate agents in Leslieville, Toronto, ON. Visit the Point2 Homes blog and you can find up to date expert advice on many markets throughout Canada, regular market reports, neighbourhood scoops in cities throughout the provinces, real estate deals and useful recommendations. Leslieville is a hub for the arts, with theatres, production companies, opera groups, casting agents, and art galleries located throughout the neighbourhood. There are many public transportation options in the area, and residents can also use the numerous trails winding through the neighbourhood. 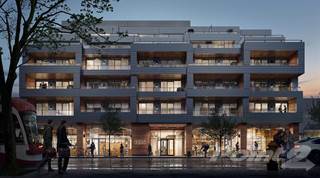 Leslieville’s proximity to downtown Toronto provides easy access to additional amenities and employment options, although the neighbourhood has plenty to keep residents busy. Leslieville’s history can be seen in the many historic buildings still standing and being used today. Leslieville is located in the southern section of the city, close to the shore of Lake Ontario. The neighbourhood extends from Don Roadway in the west to Coxwell Avenue in the east, and from the Canadian National railway line in the north to Lake Shore Boulevard E in the south. Leslieville offers plenty of trendy restaurants and shops, as well as fitness, yoga, and recreation options. Several commercial hubs can be found in the neighbourhood, making amenities accessible via walking, biking, or taking public transit. Ashbridge Estate has a rich history in the neighbourhood. The Ashbridge family were English Quakers who left Pennsylvania after the American Revolutionary War and settled in the area in 1796. Log cabins and frame homes were first built on the site, with a large family home built in 1854, which has been preserved and still stands on the site. The family donated the estate to the Ontario Heritage Trust in 1972, and today it is home to the Ontario Archaeological Society, the Ontario Society of Artists, Fusion: The Ontario Clay and Glass Association, and Camp Quality. Visitors can wander the grounds and explore the nearby bay and park, both named after the family. Those looking for some retail therapy can head to Gerrard Square, an indoor shopping centre housing over 55 shops and service providers, such as clothing, accessories, gifts, home décor, electronics, an optician, a medical centre, and banks. There are also a number of dining options in the mall. Leslieville has a dizzying number of restaurants and cafés to choose from. Pinkerton Snack Bar on Gerrard Street E is a rustic, cozy spot that offers tasty tidbits and a wide variety of beverages. The venue is a popular place to grab drinks with friends and enjoy the fun atmosphere. Chino Locos on Greenwood Avenue is a wacky counter-serve restaurant with Mexican-Asian fusion dishes. The food is just as colourful as the décor inside, and the cooks/servers are often wearing luchador masks to add to the experience. Maha’s on Greenwood Avenue is an Egyptian restaurant focused on brunch offerings, including eggs, sandwiches, falafel, soups, and beverages. The sunny venue is great for gathering with family and enjoying a relaxing meal together. Hearty portions of traditional Italian food are served up at Baldini Restaurant on Queen Street E. The elegantly decorated space has a romantic vibe, perfect for a special date night. Apartments are the most common housing type in Leslieville, along with detached and semi-detached single-family homes and row houses. The average price for single-detached homes in the area is $958,109, which is higher than the average price for single-detached homes in Toronto overall ($730,472). The population of Leslieville is 25,642, and this has been rising slightly for the past 15 years. Families make up 12% of the population here, 40% are couples, and 48% are single. The average annual income is $68,813, which is similar to the average annual income in the city as a whole, and 68% of residents are university or college educated. 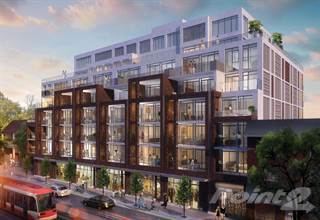 With its close proximity to downtown Toronto, Leslieville can be affected by local traffic and industry air pollution sources. Noise issues are common near major roadways and busy commercial sections. Leslieville’s crime rate is similar to other areas of Toronto, and lower than the downtown crime rate. The most common type of crime in the area is breaking and entering (commercial and residential). Schools in Leslieville include Leslieville Junior Public School, Duke of Connaught Junior and Senior Public School, Roden Public School, St. Joseph Catholic School, Riverdale Collegiate Institute, Morse Street Junior Public School, and Bruce Public School. Private school options are also available in the neighbourhood. Residents must look outside of the neighbourhood for post-secondary options. 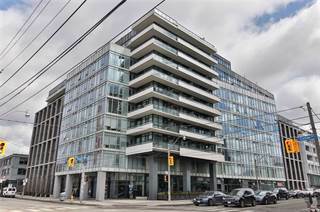 West of the neighbourhood (closer to downtown Toronto), post-secondary institutions such as Ryerson University, the University of Toronto, Wilfrid Laurier University, OCAD University, Victoria University, CDI College, triOS College, and Herzing College can be found. Leslieville is home to many parks, including Jonathan Ashbridge Park, which features a playground, a wading pool, and two tennis courts, and which hosts the Leslieville Farmers Market; Greenwood Park, with an off-leash dog area, a splash pad, two ball diamonds, a community garden, a picnic site with firepit, a playground, a pool, and a multipurpose sports field, as well as an artificial ice rink used for ice hockey in the winter and ball hockey in the summer; John Chang Neighbourhood Park, with a playground, greenspace, treed areas, walking paths, and benches; the Matty Eckler Playground, featuring a playground, a basketball court, a ball diamond, two outdoor chess tables, and a wading pool; and Hideaway Park, which has a ball hockey pad, an off-leash dog area, a playground, and a wading pool. The Matty Eckler Recreation Centre has a computer/training room, a dance studio, a fitness/weight room, two games rooms, a gymnasium, an indoor pool, three multipurpose rooms, kitchen facilities, and a lounge area. Drop-in programs offered at the centre include basketball, table tennis, badminton, ball hockey, soccer, and volleyball, and there are public swim times scheduled. The centre also offers registered programs for arts and crafts, dance, music, fitness, computers, hockey, basketball, gymnastics, martial arts, soccer, and swimming. Other recreation centres in the neighbourhood include the Jimmie Simpson Recreation Centre, the S. H. Armstrong Community Centre, and Applegrove Community Centre. Community programming can also be found at the Gerrard/Ashdale Library.